The Fascination Advantage Assessment It all began with the F-Score. A 28-question test that assessed the way you fascinate others. After 50,000 people took the F-Score, we went back to the research and the custom algorithm to develop The Fascination Advantage Assessment. With this powerful 28-question assessment, we can accurately determine your Personality Archetype. Over 250,000 have participated in the assessment since 2010. The assessment is based on two decades of research – both qualitative and quantitative. Fascinate commissioned interviews throughout the U.S. with people to study how and why they become fascinated by certain people, as well as measuring their own levels of fascination. It also includes primary research with experts in different fields of psychology, linguistics, biological anthropology, and mathematics. The assessment runs on a custom algorithm, scoring each of the 28 questions according to our research on the 7 Advantages of fascination. It calculates which 2 Advantages a participant is most likely to use when persuading others (the “primary” and “secondary” Advantages), and which they’re least likely to use (the “dormant” Advantage). 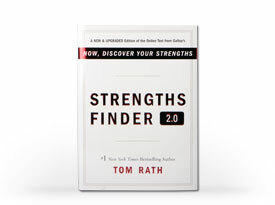 The #1 Wall Street Journal and #1 BusinessWeek bestseller that introduced the StrengthsFinder 2.0 assessment with features that include a personalized Strengths Insight Report, an Action-Planning Guide, and a web-based Strengths Community.